Getting into nature - an antidote to anxiety? I’m a big fan of retreating into the wild and just taking a bit of time out from the rest of the world, especially the online world. It has become popular these days, the whole re-wilding thing, and with good reason, because there is something deeply grounding, healing and uplifting about spending time in the great outdoors. There is this sense that the more we connect with nature, the more we recognise our own true nature, and step more fully into the more authentic version of ourselves, into the more authentic version of what it means to be alive in this world, and to be a part of this world, not separate from it. I’m become increasingly aware recently of the number of people, students especially, who suffer with anxiety. I’ve experienced bouts of this over the years, less so since I’ve been practicing yoga, but there have been moments, often healing crises, when I’m reminded of how debilitating it is to feel anxious. Anxiety manifests in so many different ways. For some it may be that awful uncomfortable and edgy feeling in the tummy, for others it might be a racing heart and heart pain, and yet for others it can create dizziness, and that overwhelming feeling of, well overwhelm. There will be some physical sensation, but there will also be a racing mind, too many thoughts and a sense of not being able to cope with daily life. I can only all from my own experience, but I do know that the last time I had a bad bout of anxiety, quite a few years now, the thing that finally helped to heal me was not only getting my hands in the earth but was getting in the sea – basically it was getting into nature. Often anxiety comes from feeling separate, feeling very alone, and very disconnected from everyone else, and from the land. It can be a very isolating experience, ironically based on the feeling of being isolated. Re-wilding can certainly ease the anxious feelings. We’re spoilt here in Guernsey, in that the Island is wild! The south coast provides an incredible opportunity to connect with, and experience the elements with the cliffs and the magnificent sea crashing onto the rocks below (well when there is a swell!). We’re also spoilt because we have Lihou on our doorstep. Lihou is a tiny island that is connected to Guernsey by a causeway at high tide. You can hire the house on the island, which is a hostel and offers 2 double rooms and 5 dormitories (I think). E and I stayed there on our own, pre-children, when the snowy owl was visiting. It was really special as we literally walked upon him on one of our walks and all the while there were keen bird watchers with their long lenses trying to get a shot of him from the coast on Guernsey! We’ve stayed a number of times since then with friends and family, but last weekend we stayed just the 4 of us, E, me and the 2 boys. It was great, there is nothing quite as wonderful as the tide coming up and knowing that you are cut off from Guernsey for the night, on your own little island. We managed a swim in the Venus pool before the tide got to high – OK perhaps it was a dip in and out, I did go in twice though! The house was cold – there is certainly some sense in visiting in the summer, but we lit the log burning stove and wrapped up in blankets. The industrial size kitchen is a challenge when you’re cooking for so few, as the stove is powerful and the saucepans etc. are huge, but I managed, and the children even ate some of their meal! It was a joy to wake and have the Island still to ourselves, high tide and a swim in the sea certainly woke us up. We walked around the island a few times collecting plastic and washed up crab pots from the beaches, and watched the birds and searched for the Lihou seal – we didn’t see him sadly! We watched the tide drop and the causeway clear, and felt like time itself had slowed down. There is no TV on Lihou and no WIFI, so you’re encouraged to get outside or to sit in the sun lounge and watch the sea and the birds instead. There are plenty of books in the house and a few games if you get bored. I can hugely recommend a night in Lihou to slow life down and help you reconnect with nature. You can’t help but leave feeling more grounded, centred and in touch with the elements. I have a sense that if you suffered with anxiety upon arrival then this would ease by the time you left. There are other ways too. Practising yoga can certainly help and I’m aware that a grounding practice and conscious and calming breathing can really make a difference. 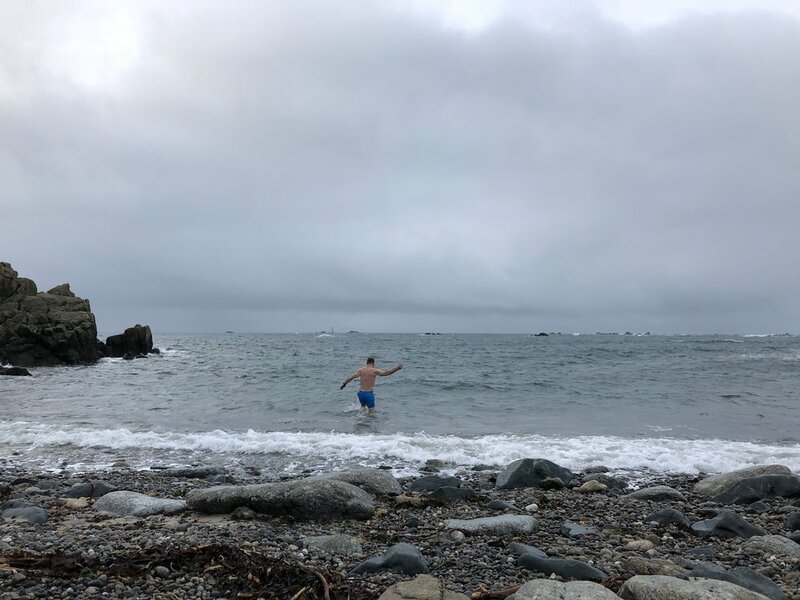 But truly, getting into the nature can make a huge difference - I’m biased but swimming the sea and getting your feet on the sand, well I do wonder if that’s the reason sea swimming has become so popular, it gets you in the elements and helps you to connect more fully with your own rue nature and feel very alive in the process! Sign up with your email address to receive news and updates about Beinspired yoga classes and events.